Disclosure: I am a John Cleese fan. I love Python, of course, but also Fawlty Towers, A Fish Called Wanda, Fierce Creatures, and pretty much anything else Cleese shows up in. So this review is coming from a pretty established fan, but perhaps not a superfan. I don’t have every sketch memorized, for instance. THE COVERAGE: This is an autobiography of John from his birth (including some background on his parents and grandparents) more or less to the founding of Python. THIS IS NOT A BOOK ABOUT MONTY PYTHON. (If you want the Python book, check out The Pythons: Autobiography by the Pythons.) I will say, though, that many of his experiences are linked to things we see later in his career, so I won’t say it’s DEVOID of Python. We’re taken though his school days to his work with the Footlights through an abbreviated teaching career and into his work on New York and then with the BBC. Graham Chapman is the Python most involved, since John worked with him longest (before Python). There is quite a lot on At Last the 1948 Show and The Frost Report. MY TWO CENTS: What’s great about the book is to see John’s experiences as he lived them, from his perspective, which is a lot more fun than reading your standard Wikipedia article. I imagined John’s voice as I was reading, and there are several fall-on-the-floor hilarious stories (which become even funnier if you imagine John presenting them). Plus, it’s amazing to reads this and think, “This is how a legend evolves.” Not that Mr. Cleese presents himself as a legend, although he should. I also loved reading about his friendships with other legends, especially Marty Feldman (and, of course, Graham Chapman). BOTTOM LINE: No fan should miss this, and nonfans should give it a try and find out what they’re missing. A bunch of my friends are getting copies of this book for Christmas; it’s too bad it doesn’t look like the audio book will be available by then. TEACUP RATING: Absolutely five out of five teacups. 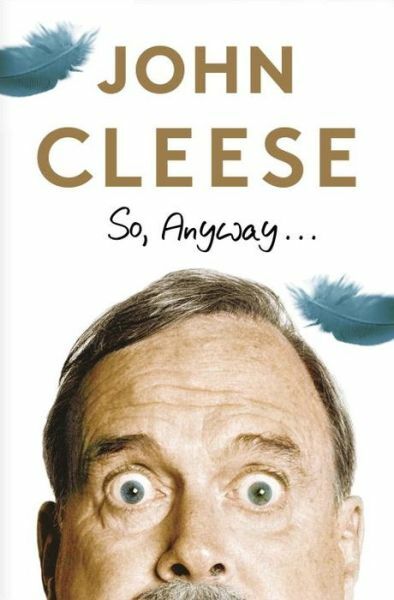 I hope Mr. Cleese writes more books about his experiences. ON SALE DATE: Available in hardcover and eformats on November 4, 2014. An audio version is listed on Amazon with no date, but I’ll be watching for it.